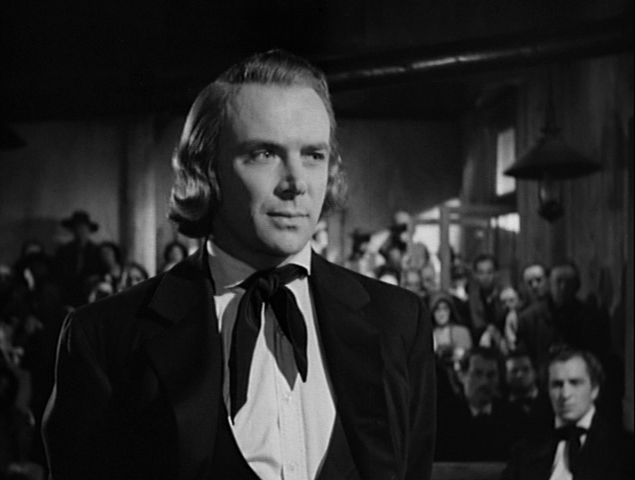 I now return to my too-long-dormant series commemorating the movies of Henry Hathaway, my personal nominee for the most neglected and underrated director of the Golden Age of Hollywood. 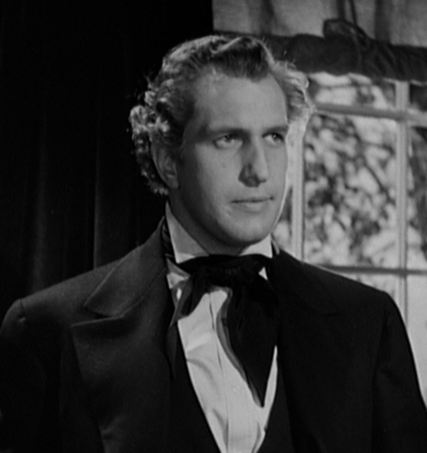 Zanuck first became interested in filming the story of the “Mormon Moses” in 1938, at the suggestion of 20th Century Fox staff writer Eleanor Harris and with the encouragement of novelist Louis Bromfield, whom Zanuck hired to write a screen story for another Fox staffer, Lamar Trotti, to turn into a script. 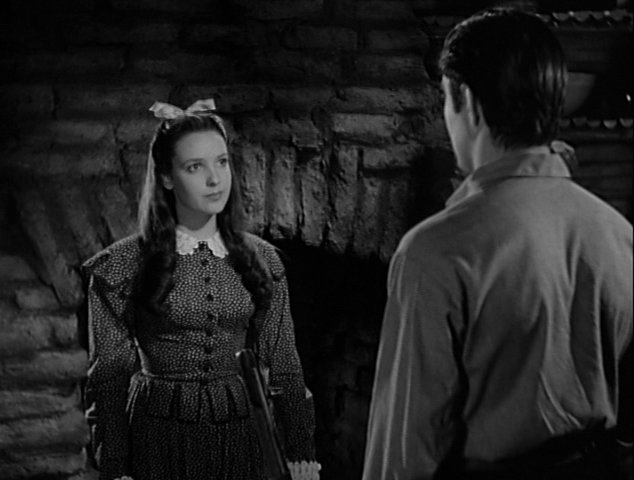 Although the title of the picture was Brigham Young, top billing went to Tyrone Power and Linda Darnell as two fictitious characters created by Bromfield and Trotti. Power was cast as Jonathan Kent, a young non-Mormon “outsider” who ends up scouting for Brigham Young and his followers on their trek west, while Darnell was to play Zina Webb, a Mormon girl with whom he falls in love. Originally slated to direct Brigham Young was Fox contract director Henry King, the studio’s specialist in historical pictures and atmospheric Americana. King had already directed such Fox pictures as State Fair (1933), Ramona and Lloyds of London (both ’36), In Old Chicago (’37), Alexander’s Ragtime Band (’38), and Jesse James and Stanley and Livingstone (both ’39). (Several of those had starred Tyrone Power, although Power had yet to be cast in Brigham Young.) It seemed a natural fit, but for some reason the deal with King fell through. James D’Arc, in his commentary on the Brigham Young DVD, says that he could find no documentation in the Fox archives explaining this. I think it’s just possible — and I hasten to emphasize that this is the purest speculation on my part — that King, a Catholic, was uncomfortable with the Mormon story. I have absolutely no evidence for this, but it strikes me as the sort of thing that wouldn’t necessarily be committed to paper. 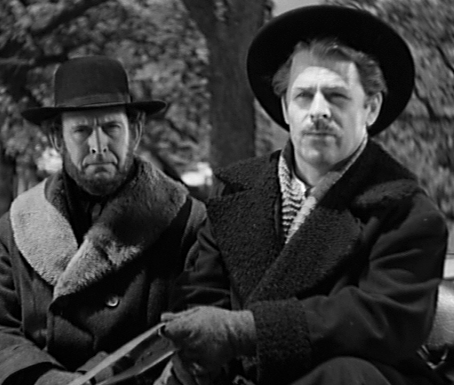 A fictitious character was Angus Duncan, played by Brian Donlevy (shown here on the right with Frank Thomas as Hubert Crum, also fictitious; Donlevy was even considered — ever so briefly, and probably not seriously — for the part of Brigham). In Trotti’s script, Duncan rivals Brigham Young for leadership in the wake of Joseph Smith’s murder. In fact, Young had no serious rival in the eyes of most of Smith’s followers, although a few men siphoned off some believers into splinter sects of their own. Angus Duncan is the voice of dissent within the Mormon ranks, at first — while Smith is still alive — advocating for craven surrender in the face of the Mormon Church’s frontier persecutors. When Duncan stands in council and whimpers “Just give them whatever they want so we can have peace!”, audiences of 1940 were clearly expected to remember Neville Chamberlain on the London tarmac after surrendering to Adolf Hitler at Munich. Later, as Brigham Young leads the Latter-day Saints on their westward exodus, Duncan becomes a 19th century American version of the Old Testament figure of Dathan, who rebelled against Moses (the Edward G. Robinson role in Cecil B. DeMille’s 1956 The Ten Commandments). Even the names are similar: Duncan; Dathan. Duncan is forever second-guessing and carping at Brigham (“I told you what would happen if we settled in this valley, but you wouldn’t listen to me! You ran off with a false prophet!”). At one point on the trail, he even hears talk from an eastbound traveler about gold in California (an anachronism; gold wasn’t discovered till more than a year after it happens in the movie), Duncan then passes the gossip off as a revelation from God, hoping to lead the Mormons astray — in a real sense, offering them a Golden Calf (an analogy the script makes explicit). 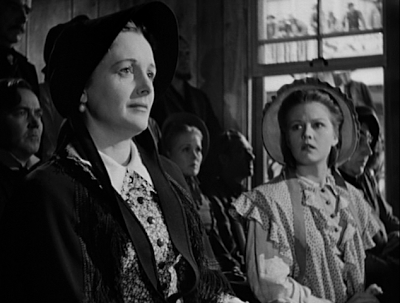 The only other mention of polygamy — and in fact the only sustained one — comes in two later scenes (90 min. into the 112 min. picture). 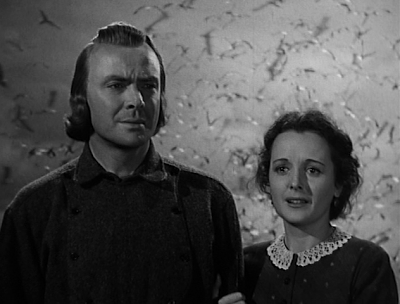 First, Jonathan Kent proposes marriage to Zina Webb, and she scornfully wonders how many more he’s going to ask, and how he plans to go about it: “Just imagine, 30 wives combing your beard!” This scene was obviously written by Grover Jones, since in Trotti’s original script it was Zina and not Jonathan who was the Mormon (how the proposal would have been treated if Hathaway hadn’t suggested the change is anybody’s guess). Immediately after, there’s a scene between Jonathan and Porter Rockwell (a historical figure played by John Carradine) where the two humorously discuss the possible population boom under plural marriage, Rockwell saying, “I’m aimin’ to do my share.” And with that, the subject is closed for the remainder of the movie. Other events in early Mormon history were treated more fully and dramatically. The picture begins with a nightrider raid on the Kent homestead during a party. Jonathan’s father is beaten to death, and even Zina’s father is shot dead — even though he’s not a Mormon himself, just somebody being friendly with the wrong people at the wrong time. This and later scenes of the persecution of Mormons had clear parallels — which Trotti’s script underscored — in Nazi Germany’s treatment of Jews. The Holocaust was still in the future, but pogroms like Kristallnacht were already on record; Zanuck even referred to raids like this in 1840s Ohio, Missouri and Illinois as “pogroms”. In the movie, Joseph Smith is tried and convicted of treason. The trial is fictional; actually, Smith was awaiting trial when he was murdered. But it dramatizes the rabid anti-Mormon sentiment of the time in the raving denunciations of the prosecutor (Marc Lawrence) and the unhesitating “guilty” verdict of the jury. 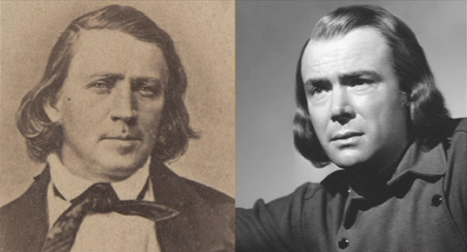 It also allows Brigham Young to address the court, describing his first meeting with Joseph Smith (shown in flashback) and delivering a ringing endorsement of freedom of religion: “You can’t convict Joseph Smith just because he happens to believe something you don’t believe. You can’t go against everything your ancestors fought and died for. And if you do, your names, not Joseph Smith’s, will go down in history as traitors. They’ll stink in the records, and be a shameful thing on the tongues of your children.” (In fact, during the events that led up to Smith’s killing, Young was in Massachusetts spreading the word and recruiting converts.) After the trial, a resigned Smith implicitly transfers care of his flock to Young — “I want you to stay and take care of my people.” — before being led off with his brother Hyrum (Stanley Andrews, the “Old Ranger” of TV’s Death Valley Days). Later, the mob murder of Hyrum and Joseph is shown pretty much as it happened that night in Carthage, Ill. 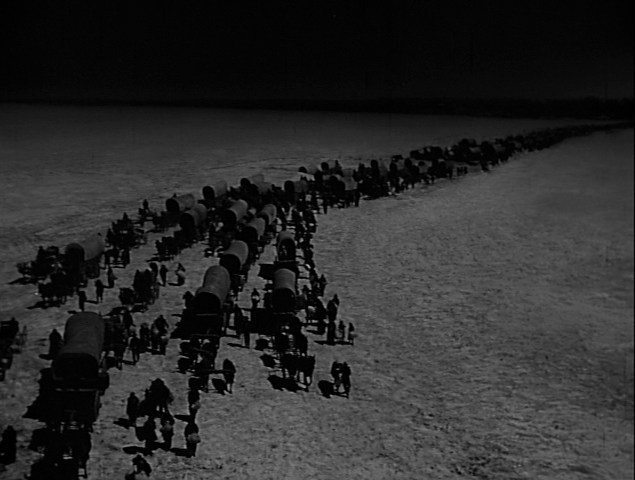 The next great dramatic set piece in Brigham Young is the exodus from Nauvoo, Ill. in the face of mounting hostility. It also occasions the first open conflict between Brigham and Angus Duncan. Like Moses in the Book of Exodus, Brigham prevails, and the Mormons light out on their trek by crossing the ice of the frozen Mississippi. Again, dramatic license is taken. The Mormons set out over a period of weeks in February 1846, not in a single night, and the Mississippi, though filled with ice, wasn’t quite frozen enough to bear the wagon train like this. But with the Mormons escaping from a band of vigilantes hot on their heels, it makes a dramatic parallel to the Israelites fleeing from Pharaoh’s army through the parted Red Sea. The climax of Brigham Young comes, not surprisingly, in the spring of 1848. After a grueling and disastrous winter of 1847-48, when the Mormon settlement in the Great Salt Lake Valley faced starvation that threatened to decimate their numbers — if not annihilate them entirely — things are beginning to look up with the spring planting. Then, a new disaster. A sudden infestation of crickets arrives to wipe out their crops. This scene was shot in Elko, Nev., where just such an invasion (at the time, anyhow) occurred like clockwork every few years. Hathaway and the company flew to Elko and waited. Just as they were getting impatient — “Don’t they know they’re holding up the schedule?” — the crickets arrived, and it was a nightmare as much for the company as it had been for the Mormons in 1848. 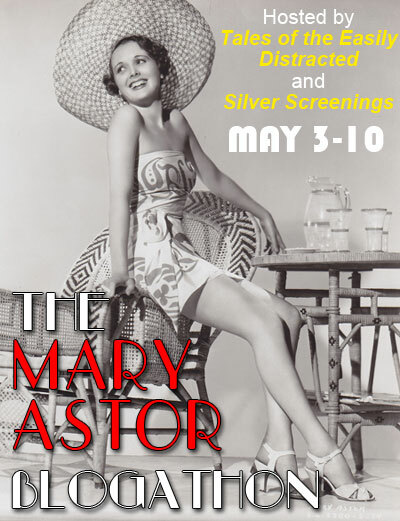 Mary Astor left vivid descriptions in both her volumes of memoirs: the ugly bugs, countless millions of them, the size of her thumb, the piles of them as much as a foot high, the stench as they died and rotted in the 110-degree heat. The scene was scheduled to be shot over four days, but after one horrible day the cast and crew were in revolt; the hell with the money, they were going home. Hathaway and Grover Jones put their heads together, combining, shifting, telescoping. Finally Hathaway assembled the company, promising to wrap things by noon the next day if everybody would knuckle down and go to it. They didn’t make noon, but by four p.m., with heroic efforts, they were done. …the famous Miracle of the Seagulls, a sky-blotting flight of birds that, in the words of one Mormon of the 1840s, came “sweep[ing] the crickets as they go”, devouring the insects and saving the settlers’ crops. 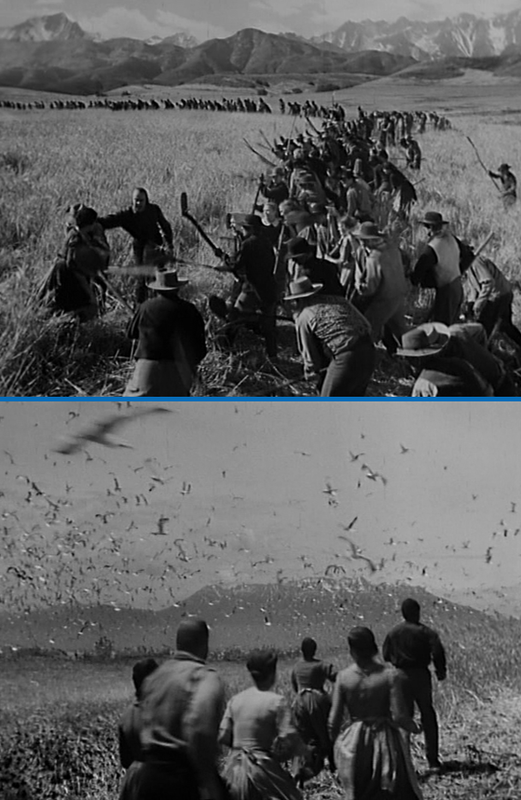 The scene of the seagulls, like this shot here, is another example of Fred Sersen’s work, combining images of the company on location at Lone Pine, Cal., with footage of seagulls shot months earlier at Utah Lake near Provo. And finally, it must be said that in point of historical fact, Brigham Young wasn’t there for the Miracle of the Seagulls; he was off to the east arranging for the safe passage of later Mormon settlers, and he only heard of his followers’ miraculous deliverance by letter from his deputies on the scene. For a movie, of course, this would never do; Dean Jagger’s Brigham — along with Mary Ann, and Jonathan and Zina, and even the ankle-biting Angus Duncan — had to be on hand, right there in what would one day be Salt Lake City, Utah, reveling in the divine vindication of Brigham Young’s leadership, which had brought him and his followers across a thousand miles of hostile prairie to their Promised Land. After its premiere in Salt Lake City, Brigham Young underwent a title change for its general release, becoming Brigham Young — Frontiersman. This is how it appeared in reviews and publicity, and on posters and lobby cards, as a way of emphasizing the pioneer rather than religious aspect of the story. But it never appeared that way on screen, as the title card that begins this post attests. 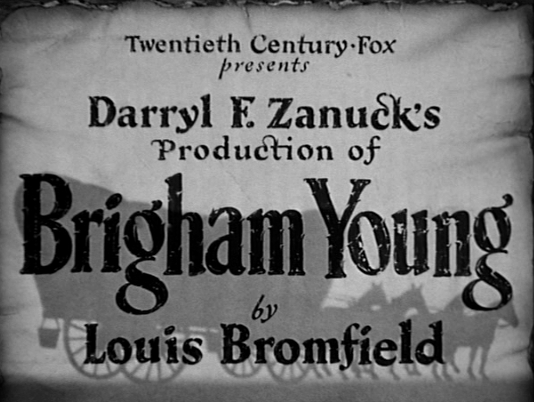 Now, the “Frontiersman” is gone for good, having presumably served its purpose, and Brigham Young again bears, in all labeling and packaging, the title under which it premiered in Salt Lake City on August 23, 1940. CW:You raise an interesting question. Hathaway's picture emphasized the viciousness of anti-Mormon persecutions, the hardships and spiritual commitment of the westward migration, and the Miracle of the Seagulls; soft-pedaled the Mormon polygamy; and omitted any mention of Joseph Smith's militarism and political ambition. I suspect that today's filmmakers, assuming they were interested at all, would take a more-or-less directly opposite approach. Jim: Great article on a neglected movie. I don't know a lot about the real story, and I found the historical background info here very interesting. Alfred Newman's title music for "Brigham Young" must have been a great favorite of someone (Newman? Zanuck?) because it was used often in westerns in the 1940s and 1950s, such as "Yellow Sky" and "The Gunfighter". I always thought it a strange piece to open the latter, its jaunty rhythms quite in contrast to the grim story that "The Gunfighter" tells.